…says the Social Manager. 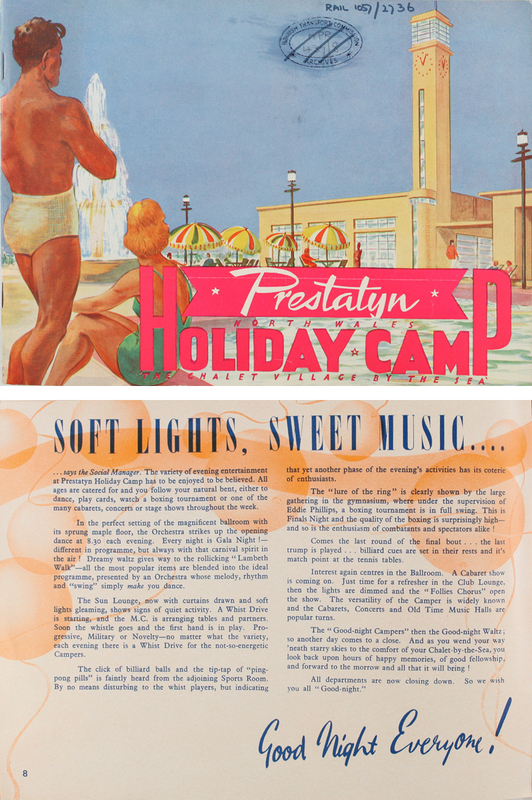 The variety of evening entertainment at Prestatyn Holiday Camp has to be enjoyed to be believed. All ages are catered for and you follow your natural bent, either to dance, play cards, watch a boxing tournament or one of the many cabarets, concerts or stage shows throughout the week. In the perfect setting of the magnificent ballroom with its sprung maple floor, the Orchestra strikes up the opening dance at 8.30 each evening. Every night is Gala Night !—different in programme, but always with that carnival spirit in the air! Dreamy waltz gives way to the rollicking “Lambeth Walk” -all the most popular items are blended into the ideal programme, presented by an Orchestra whose melody, rhythm and “swing” simply make you dance. The Sun Lounge, now with curtains drawn and soft lights gleaming, show signs of quiet activity. A Whist Drive is starting, and the M.C. is arranging tables and partners. Soon the whistle goes and the first hand is in play. Progressive, Military or Novelty -no matter what the variety, each evening there is a Whist Drive for the not-so-energetic Campers. The click of billiard balls and the tip-tap of “ping-pong pills” is faintly heard from the adjoining Sports Room. By no means disturbing to the whist players, but indicating that yet another phase of the evening’s activities has its coterie of enthusiasts. The “lure of the ring” is clearly shown by the large gathering in the gymnasium, where under the supervision of Eddie Phillips, a boxing tournament is in full swing. This is Finals Night and the quality of the boxing is surprisingly high – and so is the enthusiasm of combatants and spectators alike! Comes the last round of the final bout ….the last trump is played ….billiard cues are set in their rests and it’s match point at the tennis tables. Interest again centres in the Ballroom. A Cabaret show is coming on. Just time for a refresher in the Club Lounge, then the lights are dimmed and the “Follies Chorus” open the show. The versatility of the Camper is widely known and the Cabarets, Concerts and Old Time Music Halls are popular turns. The “Good-night Campers” then the Good-night Waltz; so another day comes to a close. And as you wend your way ‘neath starry skies to the comfort of your Chalet-by-the-Sea, you look back upon hours of happy memories, of good fellowship, and forward to the morrow and all that it will bring!All departments are now closing down. So we wish you all “Good-night”.